As predicted, the weekend brought forth the predicted south winds needed badly for a good old fashioned longshore flight along the southern shores of Lake Michigan. Also, as predicted, a cooler start and lighter winds brought a lighter flight on Saturday, with more hawks, and a stronger overall flight Sunday, with winds causing thermal sheer and lowering overall hawks, most notably buteos. Temperature wise, you couldn’t have asked for a better two days. With upper 60s on Saturday, and mid 70s on Sunday, it was very May like. Unfortunately, the May birds are still quite a bit away from the dunes. The only downside to the weekend’s flight was the total increase in new arrivals. Four new arrivals made it to the dunes. Those being American White Pelican, Purple Martin, Barn Swallow, and Blue-gray Gnatcatcher. Saturday’s major highlights include the 135 raptors that went by. Leading the pack were 41 Turkey Vultures and 32 Red-tailed Hawks (including one dark morph). Over 5,000 grackles streamed by, with an excellent 990 Rusty Blackbirds also mixing in. Some flocks were pure Rusties. Sunday brought even warmer temperatures, with starting temperatures in the mid 50s. But winds were much stronger. Enough to keep the counters down below the tower for much of the day. The dawn flight brought a much larger icterid movement. Some 10,000 grackles, blackbirds, and cowbirds moved in great streams overhead. The main flight path was nearly directly over the beach, making for great visual counting. The grackles nearly doubled the previous day, an Rusty Blackbirds exceeded the day before with 1,378 birds. Enlarge to see sample grackle flight at dawn over the tower site. Those specks aren’t your dirty screen. The major highlight of the morning was the strong flicker flight and excellent sapsucker count. An even 300 Northern Flickers undulated past the beach. Their sounds could be heard in each of the nearby woodlands. More silent and stealthy, Yellow-bellied Sapsuckers staged a huge movement in not just the dunes, but many reported stations throughout Indiana. By the end of the day, 55 of them were counted. This is the fourth highest state count ever. In case you’re wondering, the dunes area holds the next three higher records as well. Yellow-bellied Sapsucker at the old Green Tower site. In contrast to the raptor flight of Saturday, only 92 raptors were seen. Though many early Sharp-shinned Hawks were seen early, giving promise to more later. The much awaited Broad-winged Hawks did not arrive today. The other notable today was a very good 74 Yellow-rumped Warblers for this date in early April. Most high counts occur in late April, with the state record being 2,823 of them in a single day counted from this very spot. 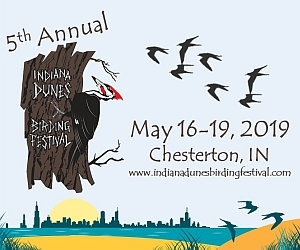 Saturday’s list is here and includes 9,047 birds coming from 68 species. Sunday’s list is here and includes 16,009 birds divided among 78 species. The current forecast shows promise for a Monday flight, but begins to waiver, particularly for Wednesday. But another warming trend is not far behind for the next wave of migrants. We’re hoping for some more of neo-tropical variety! Previous postInflux of Birds Coming! Next postA Good Friday Count!